As the Supreme Court heard arguments for and against the Chicago , IL Gun Ban, this man offered you another stellar example of a letter (written by a Marine), that places the proper perspective on what a gun means to a civilized society. Interesting take and one you don’t hear much. . .. . . .
Read this eloquent and profound letter and pay close attention to the last paragraph of the letter…. Human beings only have two ways to deal with one another: reason and force. If you want me to do something for you, you have a choice of either convincing me via argument, or force me to do your bidding under threat of force. Every human interaction falls into one of those two categories, without exception. People who think that fists, bats, sticks, or stones don’t constitute lethal force, watch too much TV, where people take beatings and come out of it with a bloody lip at worst. The fact that the gun makes lethal force easier works solely in favor of the weaker defender, not the stronger attacker. If both are armed, the field is level. 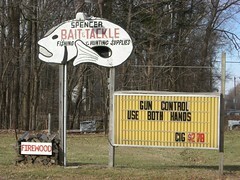 This entry was posted in Constitution, Gun Control, Right to Bear Arms by MainStreet. Bookmark the permalink.